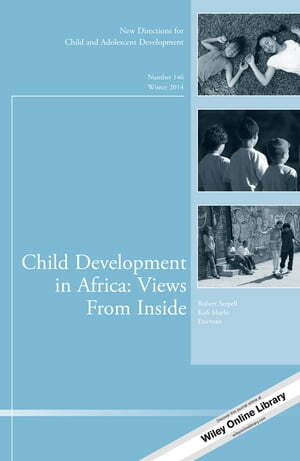 Collins Booksellers - Child Development in Africa: Views From Inside by Serpell & Kofi Marfo, 9781119039945. Buy this book online. In this volume, African scholars engaged in research on the continent reflect on their recent and ongoing empirical studies. They discuss the strengths and limitations of research methods, theories, and interventions designed outside Africa to spur innovative research on the continent. And they explore how insights from African philosophical, theoretical, and empirical work can be combined with exogenous forms of knowledge to generate understanding of the processes of African children’s development in ways that are responsive to local contexts and meaningful for indigenous stakeholders. A new field of African child development research is emerging in African societies, focusing on children as valued and vulnerable members of society and potential civic leaders of the future. Systematic inquiries are now designed to enhance our understanding of how African children think, to discover effective ways of communicating with them, and to inform successful strategies of promoting their health, education, and preparation for adult responsibilities in society. This is the 146th volume in this Jossey-Bass series New Directions for Child and Adolescent Development. Its mission is to provide scientific and scholarly presentations on cutting edge issues and concepts in this subject area. Each volume focuses on a specific new direction or research topic and is edited by experts from that field.